Imo Deputy Governor, Eze Madumere, on Friday urged the Federal Government to immortalise the late former Vice-President, Dr Alex Ekwueme, to appreciate his peaceful and unifying roles in the country’s political history. Madumere made the call in an interview with the media in Abuja while speaking on why it was imperative to remember the deceased second republic vice-president. He said that Ekwueme was instrumental to the stability of Nigeria’s democracy with his patriotic and sportsmanship style of politics displayed in 1999 as Nigeria returned to democratic rule. “We all know also the pivotal role he played in the formation of G-34 which later metamorphosed into PDP but he did not back out from the party,’’ the deputy governor said. Madumere, who described Ekwueme as a sage, called on other politicians to emulate his style of politics for stability in the nation’s democracy. He noted also that it was imperative to immortalise the late vice-president for posterity to learn from his style of politics. According to him, Nigeria will not forget in a hurry the fatherly contributions of Ekwueme in the creation of the six geo-political zones, especially the South-South aimed at giving the minorities a sense of belonging. 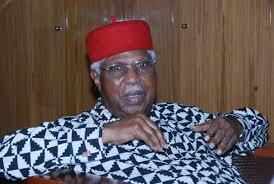 The late Dr Alex Ekwueme died on Nov. 19 in a London hospital after battling with what the family said was chest infection.